Nothing is to be held sacred, right? 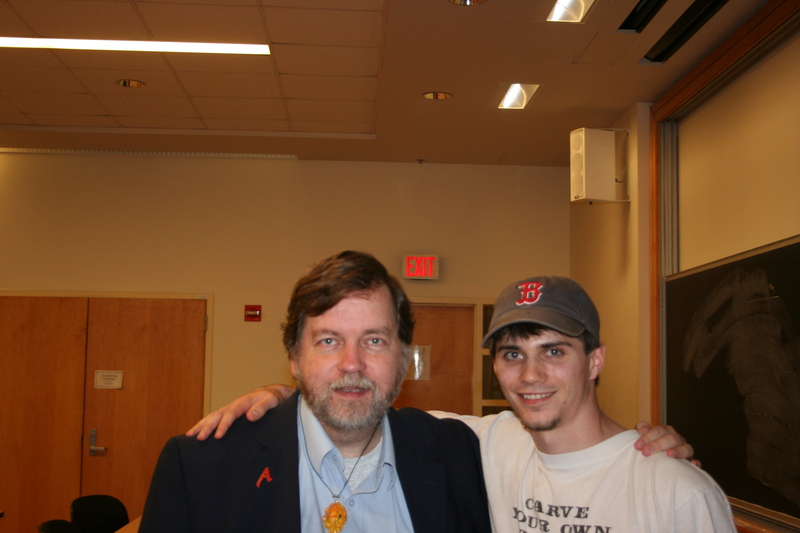 PZ Myers has this thing he does on his blog. When he finds Internet polls, he gets them Pharyngulated. People put too much stock into these things, so he attacks them just to make a point. Any result is meaningless when it is had through the interwebbings. But the normal point of attack is polls which are likely to have a pro-religion or pro-conservative sampling bias. What of polls which will appeal to the non-believers? We cannot hold these to be above attack. This is Blasphemy Day. The point isn’t to knock down religion; it’s to say that no ideas should be insulated from criticism or frank discussion. To demonstrate this, one should use blasphemy. But this principle doesn’t end at religious blasphemy. The Pharyngulation of polls should be subject to the same ideas. Richard Dawkins will be appearing on The Colbert Report tonight at 11:30 / 10:30 Central. 50% of being an atheist is correcting the strawmen people make up about us. Type “Atheism is” in Google search and the first thing you get is the suggestion “Atheism is a religion”. This is a common idea among those who have no operational (or theoretical) definition of religion. But how can it be a religion? One of the other suggestions you’ll get is “Atheism is a religion like not collecting stamps is a hobby”. This sums up the validity of this ‘atheism is a religion’ argument. But let’s actually define religion, shall we? Some key characteristics must be present for something to really be a religion. There must be some form of doctrine and dogma, even if this only references spoken word. There is usually a human-image god, but not always. Above all, there is a centralized belief system. This means that people interpret that doctrine and dogma through a narrow window. There is no outside consideration. Religion is insulation from the outside world (at least until facts and evidence become overwhelming). If any doctrine is to be true, it must comport to a centralizing belief system. Christianity, Islam, and Judaism clearly fall under the definition of religion. They are systems of belief which hold certain things to be absolutely true. In this case, it’s that there is a God. What comes from this is a supporting system. But how does atheism fall under this definition? There is a common belief – there are no gods – but it is not centralizing principle. Take baseball as an example. Almost everyone attending a game at Fenway is a baseball (and hopefully Red Sox) fan. This is a common belief – baseball is enjoyable and worth paying to see. But does it centralize anything? In the strictest sense of the word, it physically centralizes people because they must go to a particular venue, but it does not centralize any belief system. How could it? What follows from a belief that baseball is fun to watch in person? Nothing which isn’t trivial. And so what is it that follows from atheism? In essence, it is an absence of belief. Beyond this commonality, there is nothing which holds atheists together. This is one reason they have very little political power or clout. As PZ pointed out in his talk at Bates, there are more non-believers than there are Jews. The critical difference is that Jews have a centralized belief system. Atheists do not have such a definition. Many atheists believe religion is bad, but that is not true of all – and there is nothing which dictates via atheism that it is actually bad. These arguments lie outside atheism (though they may be a contributing factor to one becoming an atheist). If atheism can be defined as a religion, then it follows that deism and agnosticism can be defined the same. Why not? The only criteria presented for defining atheism as a religion is that it makes a claim about gods. “God is hands-off” and “maybe” both make claims – one speaks of the nature of a creator, one implies possibility – so why not define these as religion? Well, the answer is obvious. If atheism can be defined as religion, then the person with an actual religion has a rhetorical tool. It can be claimed that the fight is religion vs religion and that one must be right. This conveniently side-steps addressing the issue that all religion is wrong (if everything is religion and we agree that something must be true, then not everything can be false). It also places the negative connotations earned by religion into the lap of atheism. I actually like this effect since it tacitly acknowledges that religion is negative, but it fails to follow from any working definition of religion. I just got back from PZ’s talk. It was pretty exciting seeing a guy whose writing I’ve been following for such a long time. He spent some time explaining explaining Crackergate. Really, when you hear it in person, it just gets all the most absurd. People actually believe he was holding Jesus hostage. One person asked him if he thought anyone would have noticed if he didn’t publicize his actions. The response was that he only destroyed one cracker and actually has a whole bag of them still at his home. If he’s been holding Jesus hostage for over a year now, people seem to be caring less and less with time. It’s a “flash in the pan” sort of thing. I’m proud to say that I occupied a fair amount of the question time. I’m not proud that I may have prevented someone else from speaking up (and I doubt I did since plenty of people asked their own questions), but I’m glad I got to ask him the things which interested me. I would have regretted missing out on the opportunity. Hell, he’s out for a beer or a bite to eat right now with some people from the talk. I have no idea why I decided to just go home. That, I regret. One question I asked was about strategies against creationism. I told of how I have a friend who was a long time creationist (though not of the young Earth variety). He would repeatedly say he had studied the evidence for evolution and that he found it inadequate. I would engage him on a rhetorical level, speaking of the strength of the evidence, how it underlies all facts of biology, how it is the only thing which made sense of the fossil record and our genetic relatedness with other animals. But none of this said why evolution is true. Eventually I got fed up with the rhetoric and went right to town. I followed various chapters of Jerry Coyne’s Why Evolution is True and really pressed him for answers. I knew he would have no creationist response because there is none. All creationism offers is canards, hand-waving, emotional appeals, and other fallacious arguments which do not engage actual evidence. I found success. This friend now accepts the validity of evolution. Of course, he also inserts a Ken Miller-style God and the incorrect argument that intelligence is inevitable. But none-the-less, I am genuinely ecstatic that he has come around on a good portion of the science. So I asked PZ what he thought the best strategy was. One the one hand, we want to maintain a strong rhetoric that denounces creationism as loony and silly and not worthy of in-depth engagement, but on the other hand, we need to engage them on a deeper level to carve away their unscientific beliefs. Do we act like they deserve attention or do we try to denounce them? Oh, and most important of all? 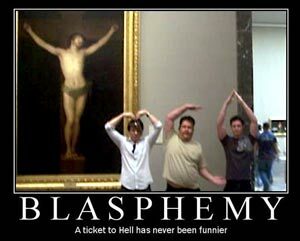 Tomorrow is Blasphemy Day (and here). The purpose of Blasphemy Day is not to promote hate or violence; it is to support free speech, support the right to criticize and satirize religion, and to oppose any resolutions or laws, binding or otherwise, that discourage or inhibit free speech of any kind. While many perceive blasphemy as insulting and offensive, this event is not about getting enjoyment out of ridiculing and insulting others; rather, it was created as a reaction against those who would seek to take away the right to satirize and criticize a particular set of beliefs given a privileged status over other beliefs. Criticism and dissent towards opposing views is the only way in which any nation with any modicum of freedom can exist. Without this essential liberty, those in power are those best able to manipulate others will suppress and silence dissent by labeling it “defamation” or “blasphemy” or whatever other bogey words they can use to stifle opposition by turning popular sentiment against it. Please, do not let them do this. As usual, humanists are relying upon broad principles and consistent beliefs which go beyond the mere-ness of the individual. I hope that even the religious will appreciate the sentiment behind tomorrow (and I’m sure some will). Do not tread upon the rights of the individual for the sake of your beliefs. No set of beliefs are to be held sacred or above reproach.